A French drain rids your yard or basement of unwanted water. Do you have a pool of water that collects in the middle of your yard and prevents grass from growing? How about a drainage problem around the perimeter of your house that causes moisture to seep into the basement? Perhaps you have a washed out driveway. 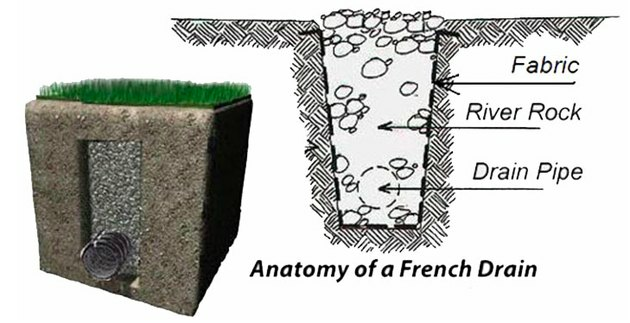 The solution to all these problems is a French drain, which sounds like a trendy European import, but is actually a grassroots drainage method that is as American as apple pie. The French drain takes its name from its inventor, a Massachusetts farmer named Henry French, who built the first one in 1859. It's basically an underground drainage system consisting of a sloping trench filled with gravel and a perforated drain pipe and covered with drain rock and landscape fabric. It collects water from places where you don't want it and channels it to a location from where it can safely run off, be absorbed into the ground soil, or be pumped away. French drains can be used inside or outside the house, and when you need one, virtually nothing else is an adequate substitute. It's common to enclose the gravel and drain rock in landscape fabric to keep it together. Pools of standing water that form in yards with large depressions or poorly draining soil can create all kinds of problems. Standing water provides breeding areas for mosquitoes, it drowns vegetation and basically makes that part of the yard unusable. Installing a French drain is one of the most effective ways to channel the water to another part of the yard, to the street or to a dry well. This type of drain is known as a shallow French drain or a curtain drain. A shallow drain consists of a modestly sized trench about 12 inches wide and dug to a depth between 12 and 24 inches. The trench should have a minimum downward slope of about 1 inch per 8 feet toward the area where you want to direct the water. 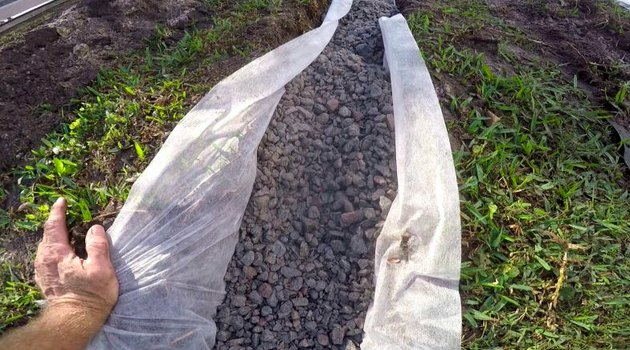 Line the trench with landscape fabric, fill the bottom with gravel, set a 3-inch perforated drain pipe on the gravel, and backfill with drain rock. Fold the landscape fabric over the drain rock, cover with topsoil and plant grass, and no one will know the drain is there. It's common to locate a shallow French drain at a slightly higher elevation than the depression in which the water collects. That way water headed for the depression flows into the drain instead, and the pool of standing water disappears and doesn't return. 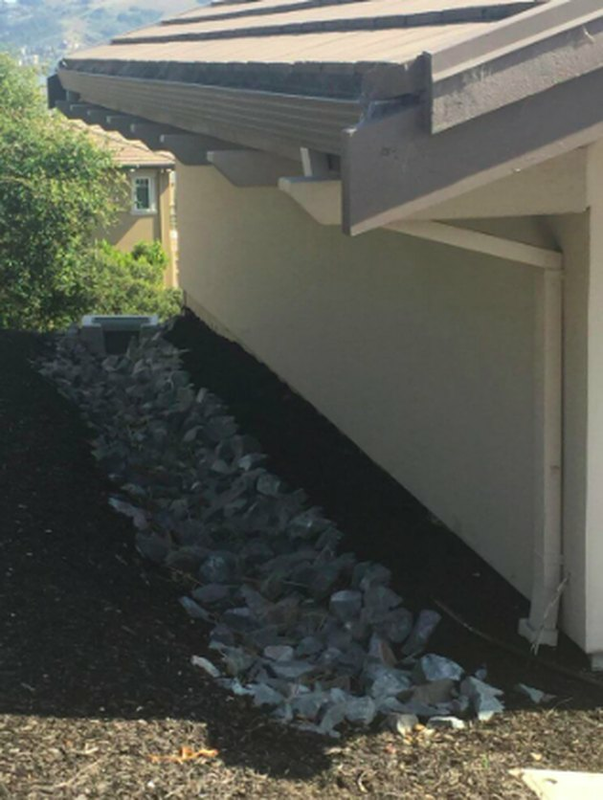 credit: Montclair Construction and Structural, Inc.
A French drain dug around a foundation is also known as a footing drain. Setting a house foundation on flat ground can create a depression that collects surface runoff, and water from the roof may add to it. A French drain constructed around the perimeter of the house, also known as a footing drain, channels the water safely away from the house and prevents it from seeping through the concrete foundation and into the basement. This type of drain is also known as a deep French drain, because it must be dug down to the level of the footing, which is often deeper than 2 feet. The time to install this type of drain is while the house is being constructed. It's much more difficult and expensive to do it afterward, when it may involve moving decks, walkways and shrubbery. A basement drain often feeds into a cistern from where the water is pumped out. If your home is built in a location with high groundwater, surface runoff isn't your only problem. There is often enough hydrostatic pressure in groundwater to force water up through a concrete foundation or floor slab and flood the basement. This is a common problem, and installing a French drain in the basement is an effective way to deal with it. 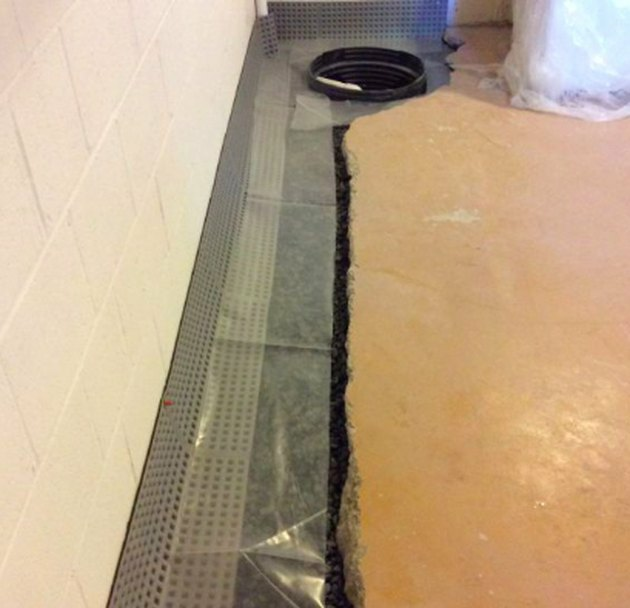 Installation in an existing basement can be expensive, because it involves breaking up the concrete floor to install the drain, and it may involve redesigning the floor to slope toward the drain. Once the drain is installed, it usually directs water to a holding tank from which a sump pump can transfer the water into the plumbing system and out of the basement. A French drain can also be designed to catch groundwater before it seeps into the basement. In this arrangement, it catches the water that seeps from below, so there's no need to leave the drain rock exposed. You can lay concrete over the drain pipes and make the whole drainage system disappear. In this context, a French drain is often known as a drain tile system. credit: Captain Ron's Lawns & Landscaping, Inc.
Catch basins maximize flow into the drain. The drain pipe is the most important part of a French drain system . You can use flexible drain pipe with slits or rigid PVC pipe with holes. When installing rigid pipe, the holes must face the direction from which the water is coming. If you're trying to control groundwater, the holes should face down, but if surface water is your main concern, they should face up. Installing catch basins in outdoor drainage systems improves the flow into the drains. Catch basins are available at the same retailers where you buy the drain pipes. They are designed to fit on the pipes, and they have a removable grid, allowing the basin to be used as a cleanout when the drain pipes clog. A French drain is a virtual necessity when building a retaining wall on a hill. It should be located on the uphill side of the wall so it can catch water running down the hill and prevent it from undermining the wall. 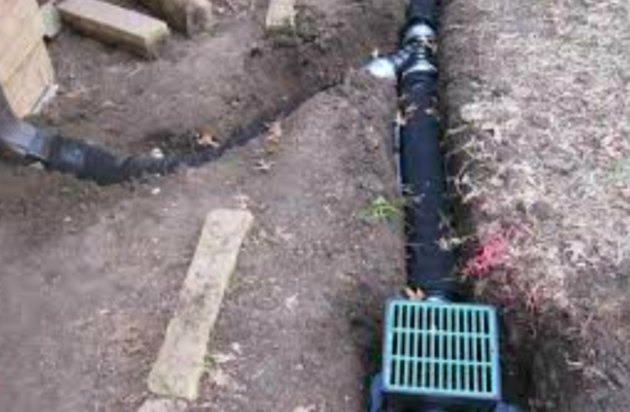 When installing a French drain near shrubbery or trees, it's best to use rigid pipe and to use non-perforated pipe within 10 to 20 feet of any bush or tree. This will help prevent the roots from growing into the pipes and clogging them. If roots grow in the pipes anyway, you can usually kill them by introducing salt through the catch basins or through a cleanout, so be sure to provide one when building the system.